Volunteer for the Student Outreach Program! Presented by members – professionals in careers ranging from architecture, to construction management, to skilled trades – with the goal of introducing boys and girls to career opportunities in the central Ohio construction industry they may never have previously considered. Contact Pam Austin to become an Outreach volunteer. Since the program's inception, BX volunteers have reached more than 93,000 central Ohio students. A two-person "team" of speakers visit schools for a 35-minute interactive presentation. 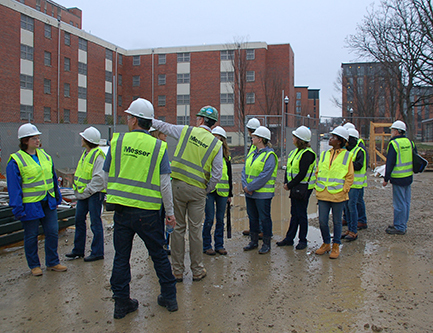 The program also hosts an annual jobsite tour for educators interested in learning more about the career opportunities available to students. For more information about sponsoring a jobsite tour or getting involved with the BX Outreach program, contact Pam Austin.